Located in the heart of the Las Vegas Strip, ARIA Resort & Casino is a AAA Five Diamond Award-winning destination that is different by design. It is an epic resort filled with spectacular public spaces, lavish amenities and endless temptations. ARIA’s luxurious guestrooms and suites, including the exclusive ARIA Sky Suites, feature plush bedding, expansive floor-to-ceiling windows, and advanced integrated technology that puts total control of lighting, temperature, music, and breathtaking views at guests’ fingertips. Impeccable hospitality and personalized attention join with an incredible array of attractions. 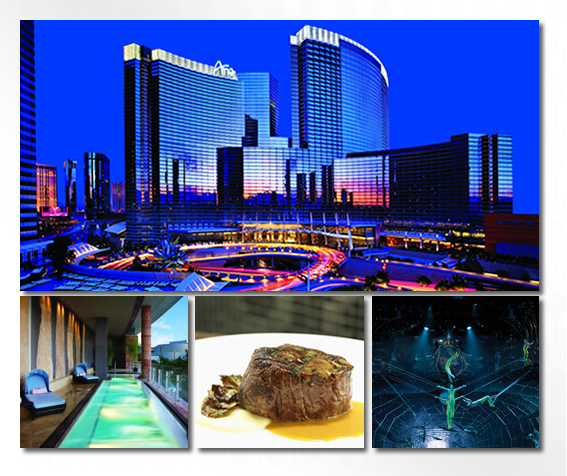 The resort features a variety of acclaimed dining options from award-winning chefs, a distinctive collection of lounges and bars, including HAZE Nightclub, the indulgent Spa & Salon at ARIA, and the visually stunning acrobatic spectacular Zarkana™ by Cirque du Soleil®. From world-class shopping and exhilarating gaming to the limitless adventures around every corner, the awe of ARIA is sure to seduce you. © Michael Jordan Celebrity Invitational. All rights reserved.